The Lima News looks at the changing automotive world. Catch up on the series at LimaOhio.com/tag/DrivingChange. LIMA — While many look to the coasts for the latest technological innovations, Ohio is making a move to be a driving force behind the development of autonomous vehicles. Under the Drive Ohio initiative, Gov. John Kasich authorized autonomous vehicle testing in the state, and since January, six autonomous vehicle development projects have began throughout Ohio under its umbrella. Altogether, 164 miles of road in Ohio are currently under construction to serve smart mobility projects, representing roughly $500 million in public and private investment in the state. Some of that testing isn’t too far from Lima. Through the Ohio Department of Transportation and other regional transportation players, Marysville is making its name known in the autonomous testing space due to its involvement with the 33 Smart Mobility Corridor and a related program called Connected Marysville. The 33 Smart Mobility Corridor is a 35-miles stretch of U.S. Route 33 connecting the Transportation Research Center in East Liberty to the outer belt of Columbus, which is being rigged with a sensors able to communicate with the vehicles zooming over the road. 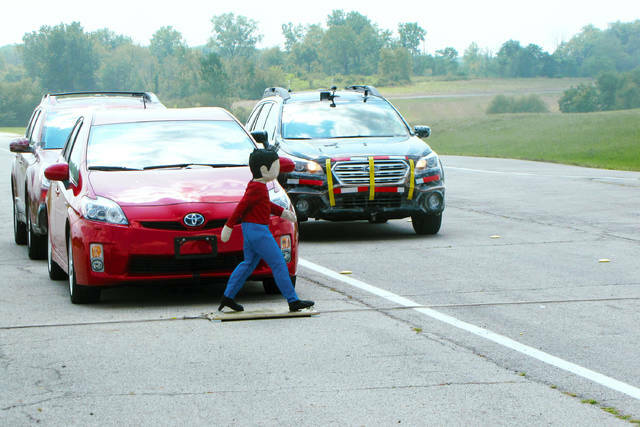 The extensive infrastructure improvements allow researchers to look at how vehicles would need to talk to each other and to the infrastructure itself in order to maneuver safely on highways and through intersections without the input of a human driver. Eric Phillips, the economic development director for Union County and Marysville, called the setup a connected-vehicle environment, or CVE. “We’re trying to create that ultimate playground along that 35-mile stretch,” Phillips said. Human drivers don’t have to worry about driverless vehicles along U.S. Route 33 quite yet, as the technology is still in its infancy. Phillips said he expects truly autonomous vehicles won’t exist for at least a few decades. In the meantime, drivers may see truck platooning, which is the fancy term for a train of connected semi-trucks on the highway. Eventually, Phillips said there have been some discussions to extend the “smart corridor” along Interstate 75 up north as far as Ann Arbor, which could impact the Lima region. Those talks are still in the planning stages, and Lima Mayor David Berger has expressed the city’s interest. “We’ve had the people in from Columbus to talk about the project and to see if there’s any way we can be part of this,” said Berger, who also chairs the Lima Automotive Task Force. Other autonomous vehicle projects under Drive Ohio include outfitting the Ohio Turnpike as a testing site, installing short-range digital communication units along a stretch of Interstate 90 and creating a “smart” transportation system throughout Columbus. “TRC’s SMART Center is designed to test new technologies and highly automated vehicles in a closed, safe, secure and repeatable real world environment, before the vehicles are deployed on public roads and highways,” former TRC CEO Mark-Tami Hotta said in a 2017 press release. The funding helped the TRC construct the industry’s largest high-speed intersection, a large testing platform and a network of intersections, roundabouts, wooded roads and neighborhood streets in order to simulate the environments autonomous vehicles may encounter. Further expansions are expected to construct an indoor test facility allowing severe weather conditions to be replicated year-round and a six-lane highway to test vehicle swarming and truck platooning. “There’s been an explosion of demand for active safety and autonomous testing around the world, and TRC’s SMART Center is committed to providing a comprehensive solution to that demand,” Hotta said in a press release. Reach Josh Ellerbrock at 567-242-0398. This entry was tagged Driving Change. Bookmark the permalink.